Whether you’ve been writing professionally for a long time or are an aspiring blogger or journalist, you probably know titles and headlines are some of the most important parts of a piece. Sure, they’re short — but they give readers an idea of what to expect from the content and help them decide whether it’s worth their time to read more. Below, check out some of my tried-and-true title formulas and learn more about the most appropriate times to depend on them. This title formula is great to use when conveying you’re a thought leader or an authority on a subject. The first part indicates you want to spread knowledge. Next, it’s helpful if the second component of the formula relates to an on-trend topic, such as a matter that’s seasonal, newsworthy or otherwise on people’s minds. Finally, the third part should represent a desirable outcome. Take the title, “How to wrap an awkwardly sized holiday gift in only five minutes.” Wrapping holiday gifts is an action that most people take — and lots of consumers buy gifts that are strangely shaped and otherwise hard to wrap, so it appeals to broad audiences. If you publish it just before the holiday season, the timeliness is also enticing to people who want to finish gift wrapping more efficiently this year. Use this formula when you feel confident about sharing what you know with others. By its nature, the word “secret” suggests you know something that’s not common knowledge to a majority of people. It could also emphasize that you’ve come up with a cool way of doing something that could help readers live better, be more assertive at work, or otherwise thrive unexpectedly. That element of mystery — along with the discussion of an often-experienced scenario — makes your content more click-worthy. The singular nature of the word “secret” in the title suggests you’re discussing one tidbit of wisdom, so only try this formula when that’s the case — not if you want to make several suggestions. The headline “The secret to getting to sleep faster when you’re anxious” could be used for an article that tackles a subject affecting almost everyone at one time or another. Even people who do not live with chronic anxiety will eventually find occasions where it’s hard to get rest due to worries about upcoming travels, an ongoing health issue or a family problem. No matter what you discuss in the content, express that you understand and/or empathize with what people experience. The “things you need to know” part of this title automatically makes people pay attention. That’s why it’s a good formula to highlight urgency or when you think the information you’re providing is among the best available. Take the title, “4 things you need to know before making a successful move to another country.” It appeals to people who are interested in becoming expatriates. It also gives them the sense that there are certain insights they need to know before making their attempt, or else they might fail. Having a number at the start of the title is also useful because it sets expectations about length. If the number is higher than ten, that’s a good indication it’s a long article and may not be good for a person to read until there is enough time to devote to getting engrossed in it. If you’re writing about a subject that’s often misinterpreted or misrepresented, this title formula is a gem. The word “myths” itself attracts attention since it stimulates curiosity. A popular reason why people write titles this way is because they want to clarify pervasive misunderstandings about a subject. However, if you’re elaborating on a topic that is not universal, make sure to mention you’re basing things on personal experience or research. The title, “4 common myths about living with cerebral palsy” could be a great way to shed light on how cerebral palsy impacts your life, if applicable. If you’re talking about matters that often make people feel frightened, it’s great to debunk some of the thoughts or assumptions that perpetuate the fear. By doing that, you could act as an advocate for a sector of society at large. Do you want to enlighten readers about a cool event in your life or what transpired when you did something especially bold? This type of headline works well for doing either of those things. You could also use it when you’re trying to raise awareness about a cause that matters to you. Consider the following: “Here’s what happened when I went for an interview at Google.” Getting called for a Google interview is often among the dreams people have. Even people who don’t aspire to work at the company understandably want to know what the interview process is like because they find the organization — or at least its success — fascinating. Writing in the first-person voice also helps you build rapport with readers. However, make sure not to break any confidentiality agreements with this kind of piece. Your content could also take an inspiring turn, especially if you cut out a bad habit. Consider the possible effect on readership that a title such as “Here’s what happened when I gave up soda for a year” might have. This title formula is especially handy when writing about ways to help readers avoid pitfalls or problems. The “warning signs” part gives people guidance about things to look out for, which could help them feel empowered or more educated. How about the title “5 warning signs that your house has a rodent problem”? People might know mice are on the loose if they hear scratching at the walls, but if you bring up lesser-known symptoms of this common home issue, they’ll appreciate the newfound knowledge. If you’ve just dealt with something and want to help others through the experience, try this approach. People love top-ten lists. There are even entire websites devoted to them. By using this formula, you’re almost automatically creating a crowd-pleasing post, provided your research is solid. This type of title is excellent when you want to cover a broader topic in an engaging and scannable way. By reading each header of the list, people know what kind of content is underneath. This formula also lets you appeal to niche audiences. Take this title: “The top ten books for early-learning educators.” The general population won’t be interested in the entire content, but people who teach preschoolers or are studying to get licensed to educate them certainly will. Because the last part of the title is so broad, you can use this formula whether you’re going into detail about car stereos or Cancun destinations, which offers plenty of flexibility for writing. Even the most motivated people prefer to take the easy route to betterment. That’s why the first word of this headline is so powerful. If people are looking through lists of search results and seeing this title versus one that just begins with “ways,” they’ll likely pick this one, because whether they realize it or not, simplicity is the natural preference. Pitching music to festival promoters and getting noticed is a feat in itself. Not coming across as an amateur is another hope many indie songsters have because they know they’re usually at an automatic disadvantage without the backing of major labels. Speaking of familiar challenges in your title is ideal because it makes you come across as relatable and in-the-know and attracts people who are ready to improve. Ever notice how popular magazines often use the cover space to promote an exclusive interview inside? That’s because the publishing companies want to draw attention to the fact that people can only read this transcribed discussion in one place. Maybe you’re lucky enough to have landed an interview opportunity with a person who is characteristically elusive or very prominent. In either case, this title formula is a winner. The word “exclusive” assures readers they won’t read similar interviews elsewhere. Also, people typically like Q&A formats because they give glimpses into the minds, habits, and beliefs of individuals who have made an impact. Plus, the fact you’re just covering highlights tells your audience you’re delivering the best of the best straight to them. You might also include a link to the full interview. The title, “Highlights from an exclusive Q&A with Jeff Bezos” tells readers you’ve gotten time with Amazon’s CEO. However, it’s not necessary to reserve this title tactic only for people who have that much clout. If someone in your town is serving as the first female police chief or has been instrumental in implementing a new recycling program, you could use this formula, too. People often feel reluctant about trying something unless they know it’ll deliver. That reality is why the last two words of this headline are so eye-catching. The first two are also crucial because getting more of something is frequently a positive outcome. Give this formula a try when you want to help people notice gains and feel certain you have the knowledge they need. How about, “Get more compliments by trying these four proven tips”? Keep in mind that the word “proven” means you need to have scientific research or support from an expert to support your claims. Even though life is unpredictable, there are certain things most people go through at least once. Starting a new job, moving to a different state or going on a first date with someone who’s extremely desirable are a few examples. This kind of headline gives reassurance to people who are in need of comfort and are nervous about living to tell the tale after going through something tough. The word “survival” catches the eye because it’s often used to describe beating the odds in a scenario or doing well despite preconceived notions of the contrary. Write this kind of title to let people know even if they feel in over their heads, they probably aren’t. Take the headline, “How to survive your freshman year of college.” The university experience is frequently overwhelming but offers many opportunities to share stories, maybe even humorous ones, and make people feel more at ease — especially because you’re giving a roadmap of sorts. 12. Is/are [item, food, action, technique, or decision] good or bad? Creating a title that poses a question instantly makes people wonder about the answer. Instead of scrolling or flipping past your article, they’ll probably stop at it, provided you’re addressing something that matters to them. When writing about subjects that bring up conflicting opinions, this formula is perfect. If you’re not comfortable definitively answering the question in the title, present both sides and let your readers come to informed conclusions. The headline, “Is sharing a bed with your baby good or bad?” relates to parents who have infants, and you should choose a subject that’s just as appropriate for your audience. One of the best things about this general formula is that it requires people to possibly think beyond what they think they know. Many people do things that are supposedly helpful but may actually be hindrances. You can illuminate them in content that begins with this thought-provoking headline. 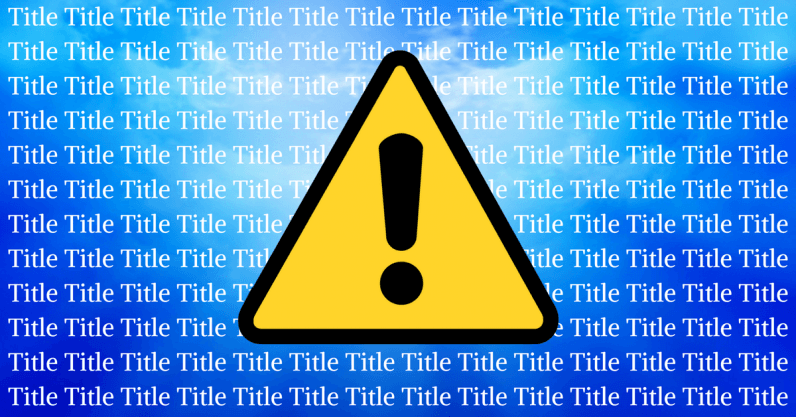 This title type is also beneficial for reminding people about habits they need to break. When you want to steer them in the right direction, start with this headline. Some individuals need wake-up calls and won’t right their ways without receiving a significant amount of feedback first. Others merely want confirmation that they need to make changes after suspecting that’s the case. The headline formula addresses both of those groups equally well. Consider the title, “3 things that are making your unproductivity worse.” It could offer eye-opening revelations that make people stop wasting time and get down to business. Regardless of what you’re covering and the type of audience being addressed, these headline formulas are must-haves for your writing regimen. Start using them as soon as you write your next piece and see what happens in terms of your readership.